OXFORD, England, Feb. 12, 2019 /PRNewswire/ -- Her Majesty Queen Noor Al-Hussein led a cavalcade of tributes to her late husband, HM King Hussein of Jordan, at a memorial event at Oxford to mark 20 years since the King's death, on 7 February 1999. Addressing the audience in person at the University's Middle East Centre she said, "His integrity and devotion to truth and justice can still guide us." President Bill Clinton: "We saw the world the same way. We weren't threatened by people who were different from us. Everyone trusted him and respected him. He just had an incredible gift. The people of Jordan were lucky to have him as a King and the world was lucky to have him as a peacemaker." HRH The Prince of Wales: "King Hussein's personal courage, cool head and sustained fortitude was dedicated to the service of his nation and to the wider good of mankind." Sir Jackie Stewart: "One of the deepest relationships I've ever had outside of my own family. He was a great man. I mean the greatest man I think I've ever met." Prince Mangosuthu Buthelezi: "The important thing about his life is reconciliation. People who didn't speak to each other were brought together by him. That takes remarkable courage. The determination and passion with which he pursued peace is his major legacy to humanity." Sir John Major: "King Hussein renounced any rights to East Jerusalem and to the West Bank. That was a brave decision to take and it put him in a very strong position later to urge for peace. He had a lifelong commitment to peace whatever the risks to himself may be." HM King Felipe VI of Spain: "King Hussein was an exceptional mediator and peacemaker. A great King, and a good man." The memorial event, hailed by all who attended as a major success, was organised by the late King's nephew, Saad Kurdi, who also produced the film which reflected on King Hussein's life. 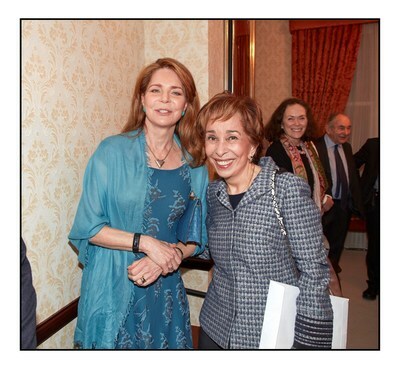 As part of Queen Noor's introduction to the event, she said, "King Hussein understood his primary role to be that of public servant rather than entitled authoritarian. He faced challenges preoccupied him throughout his reign: the well-being of all Jordanians, the volatile regional conflicts that buffeted our country and regularly erupted into wars, and the short term, narrowly self-interested politics of global powers competing for strategic advantage in the Middle East." She continued, "He achieved remarkable progress in modernizing a conservative developing society from a pre-industrial state to a modern post-industrial state in under two generations—accomplishing this through promoting universal education, women's empowerment, and a participatory and pluralistic system of governance."